Pre-race there was time to meet up with the lovely Rachel (of Fairweather Runner fame) who was taking the somewhat bonkers step of treating the race as a marathon training run by running to and from Hyde Park as well as running the race itself. We parted company at the colour-coded start pens and Ginge disappeared to take up his first cheerleading post. The start of races always makes me a bit emotional. I think it’s a combination of charity runners (especially those with personal stories pinned to them), masses of people and adrenaline that does it, but I always feel myself welling up. 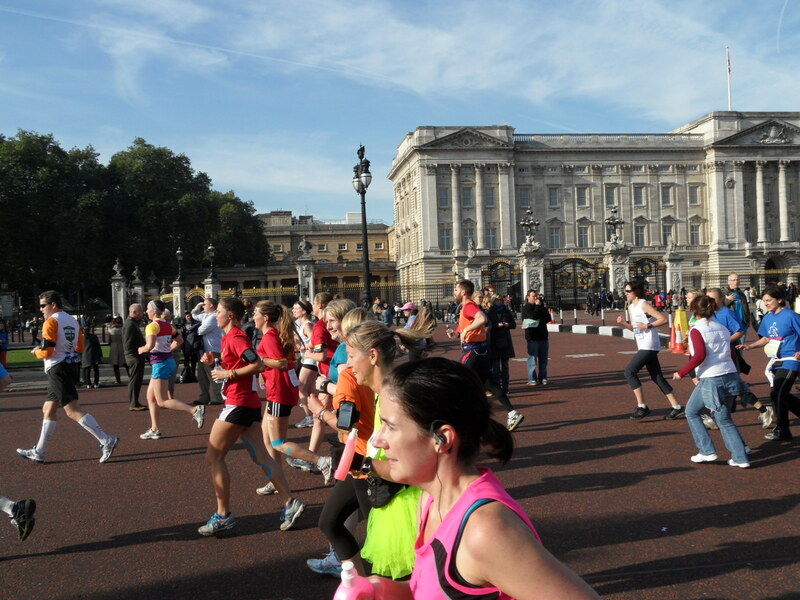 If there was a brass band playing as well then I would never make it to the start line. Park. 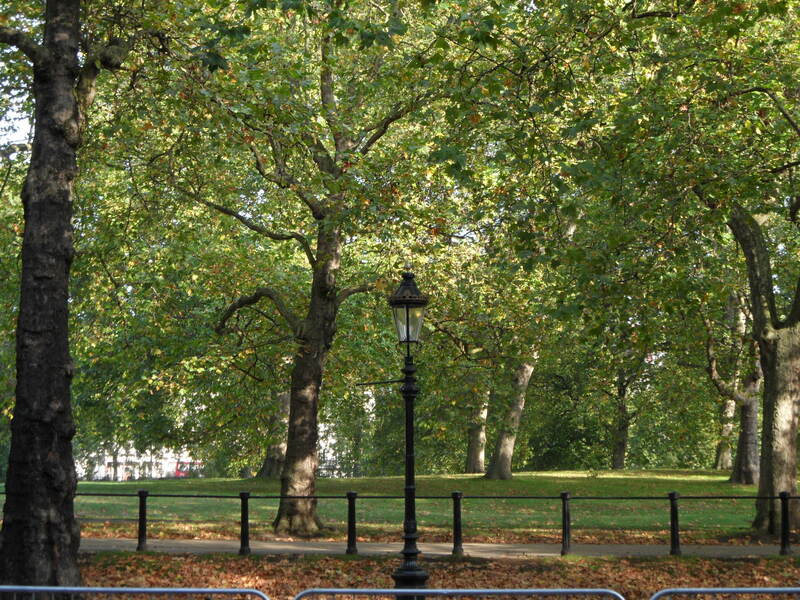 Trees, grass, parky stuff. Other than trying not bursting into tears, I never know what to do before a race, I don’t stretch or do any kind of lucky ritual, instead settling for earwigging on other people’s conversations, being generally nosy and getting into a swearing through gritted teeth argument with Miles. Apparently being in the country’s capital was too challenging for his little satellite link up and we had to endure three false starts and one “Are you indoors?” conversation before he found a signal. Releasing more than 12000 runners over the start line was a relatively smooth process taking the yellow pen 14 minutes to cross the start (oh the magic of chip timing). I’d been warned to expect a bit of congestion at the start and the end of the race, but I was pleasantly surprised by how much room I had and how little people-dodging I had to do (although in an uncharacteristic bit of pushiness, I was quite near the front of the pen). I tried not to set off too fast and to find my own pace; I think I managed it despite feeling like I was being overtaken by everyone in the world and Miles telling me that my pace was somewhere been 7min/mile and 45min/mile, neither of which seemed quite right. Park related puns at the mile markers. Each one was a welcome sight. 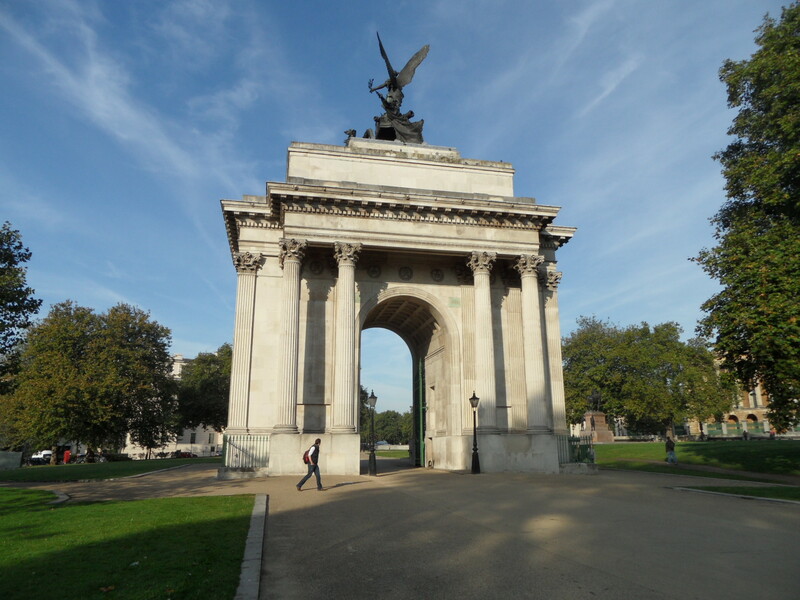 Buoyed by random happy tunes on shuffle, the landmarks of London and the promise of Ginge at selected vantage points, I felt happy and relaxed for the first 10 miles. Admittedly my pace slipped as the race went on, but I didn’t beat myself up about it. At four miles I was overtaken by Puff the Magic Dragon (who turns out to be a producer from This Morning) running for Asthma UK. Around 8 miles I was at the top of a slope when I saw the dragon in the distance (a seven foot lime green dragon is a bit hard to miss) and I’m not proud to admit that the thought “You’re mine dinosaur, mine” (I have only recently confirmed his dragony credentials) passed through my addled brain. I’m not proud to admit that I put a fair bit of energy into catching him up and overtaking him. I’m also not too proud to admit that I only managed this because the poor man was dressed as a seven foot lime green dinosaur (I overheard a small child asking “daddy, why is the dragon walking?”, “I think he’s a bit hot” came the reply). I’m not proud of any of this, but we take motivation wherever we can find it. For those of you who don’t know me, I am one of those two leggy girls in the tiny shorts. The last three miles were hard work. By this point, you’ve long left the views of the Eye and Westminster, and are on the second lap of the parks. Now I like a good park and the autumnal scenery was lovely (even in my thirties I can get giddy at the sight of conkers), but it was hard work and a few brief walks crept in so that I could gather my thoughts and refresh my legs. I’m pleased to report that they were gathered and refreshed enough to manage a proper running finish, only slowing down to grab my medal off one of the very smiley volunteers. Proudly sporting my medal (alright, it didn’t come off for the rest of the day) I was reunited with Ginge and Hels for a brew and some restorative flapjack before we went out for beer and pizza later in the afternoon. My finish time was only 4 minutes faster than Folkestone (when I walked a lot more and felt dreadful from 6 miles onward) which in a way is a bit disappointing, but given the lack of consistency in my training it actually left me feeling quite chuffed that I could manage this with not very much practise. 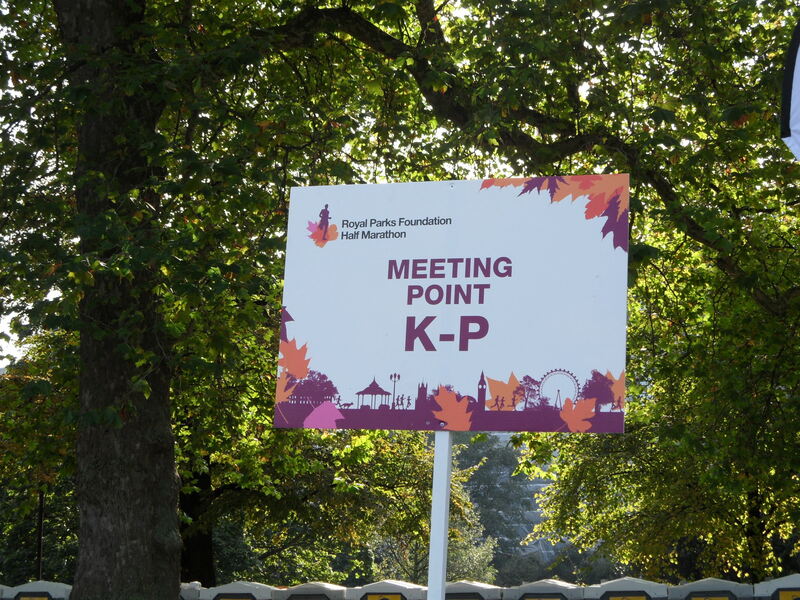 Our allocated meeting point was K-P because that stood for Knitting Penguin. Obviously. This was the biggest race that I have done and yet I enjoyed it immensely. Because of the crowds, I was never on my own or feeling as if I was watching everyone disappear into the distance. 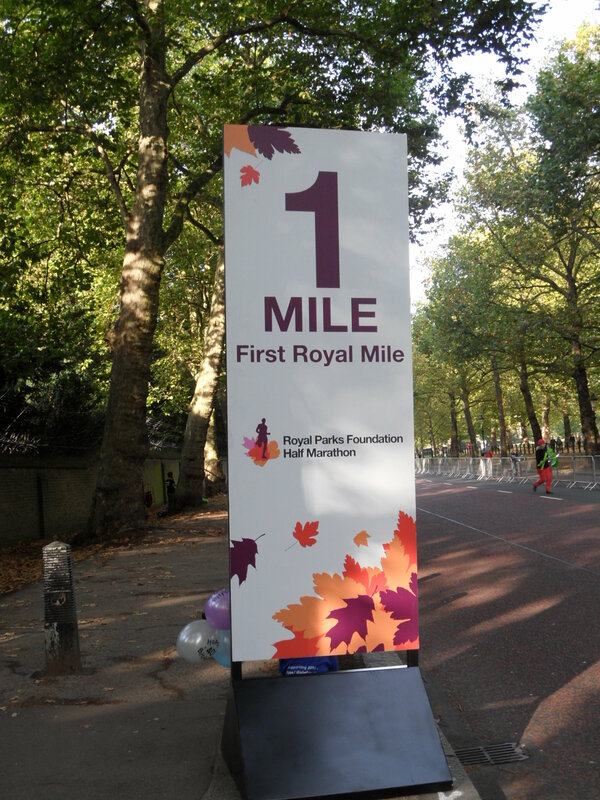 Now, I don’t know if this is the same with every big race, or if the Royal Parks is particularly well organised but it’s certainly reduced my nerves for another one. The only thing that I was slightly miffed to discover that feeling despite feeling (a) happy and (b) as if I was running well, on my official photos I look (a) grumpy and (b) as if I was just ambling down to the corner shop. I really wish race photos would stop dismantling my mental image of myself as a runner, instead presenting so-called photographic evidence that suggests the complete opposite. Would I do it again? Definitely. Would I recommend it to a friend? Definitely (unless them entering was going to nick my place). I’ve already registered my interest in next year and will be taking another punt in the ballot, but in the meantime…. Ooh I do like a bit of ear wigging in the start pens! It’s amazing what you can learn. Oh, this all made me chuckle (apart from the bit about welling up at the start, I thought that was just me > lump in throat < ). Really, well done AND talking about next year too. Isn't the medal just lovely? It's my favourite. Oh, and you look way happier and far more fun to be with than those two leggy ones. I always feel teary at the start of races, too. And I want to know who or what you’re smiling at in the photo. Thanks, that was a good read. I’ve been told by friends that a good race picture doesn’t come naturally to most, so I’d better practice looking like I’m having the best time ever and its all so easy, rather than feeling like you’ve just been run over.